Activists of the Hungarian Red Cross give water to migrants who arrived by train from Tovarnik, Croatia at the railway station in Zakany, 230 kms southwest of Budapest, Hungary, Tuesday, Sept. 22, 2015. European Union leaders are gathering Wednesday for an emergency meeting in Brussels to discuss the next steps after interior ministers agreed to a plan to distribute 120,000 migrants among the 28 nations in the EU. The plan is designed to reduce strain on EU states at the eastern edge of the bloc, which have been handling a flood of incoming migrants in recent months, many of them trying to escape violence in Syria or Afghanistan. Due to objections from Hungary, Slovakia, the Czech Republic, and Romania, the deal was passed by majority rather than unanimous vote among EU interior ministers. "It is necessary for EU countries to retain their sovereignty in this matter," Czech Republic Prime Minister Bohuslav Sobotka said. "It must be the governments who will decide." 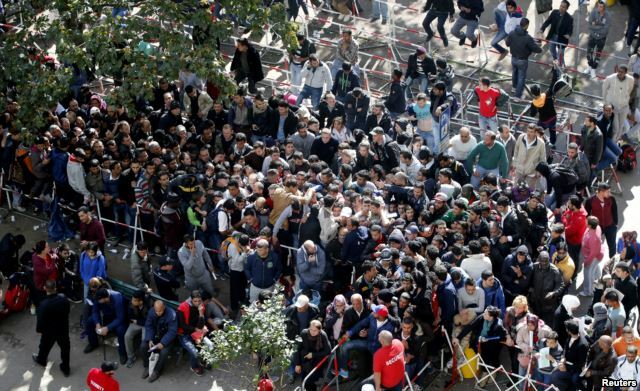 Migrants queue at the compound outside the Berlin Office of Health and Social Affairs (LaGeSo) as they wait for their registration in Berlin, Germany, Sept. 21, 2015. Nearly half a million migrants, 40 percent of them Syrians, have crossed the Mediterranean this year, fleeing war and poverty in the Middle East in search of a better life in Europe. The United Nations refugee agency said the constant stream of migrants is so large -- 6,000 a day landing on European shores -- that a relocation plan covering 120,000 migrants "will not be enough to stabilize the situation." It called for the opening of refugee reception centers on the EU perimeter. Germany has by far accepted the biggest number of refugees; but, Berlin's intelligence chief, Hans-Georg Maassen, warned that radical Islamists already in Germany could try to recruit refugees for terrorist attacks on the pretext of offering them humanitarian assistance. The EU interior ministers' meeting occurred after the European Parliament approved the quota plan last week over the opposition of several countries. On Monday, Hungary's parliament authorized its army to use non-lethal force against migrants who try to enter the country illegally. Hungary has already sealed its border with Serbia with razor wire and now Hungarian soldiers may use rubber bullets, tear gas and net guns. They can also search homes for illegal migrants. Hungary's right-wing prime minister, Viktor Orban, told parliament that the migrants "are overrunning us. They're not just banging on the door, they're breaking the door down on top of us." Other European nations are strongly critical of Hungary's reaction to the migration crisis, accusing it of using violence and Nazi-like tactics. Some nations that originally welcomed the migrants, such as Germany and Croatia, are now restricting entry, leaving men, women and children stranded in the open with no shelter or food. U.S. Secretary of State John Kerry says the United States plans to issue up to 100,000 refugee visas a year starting in 2017 -- up from the current 70,000. Saad Ali hid his face behind a checkered scarf as he talked to the media. He feared for half of his family, who were still in a Syrian area controlled by Islamic State. Next to him a man in a white shirt, who refused to give his name, said he had attempted to reach Greece by sea four times. During one of those attempts, his boat capsized, but he survived. Both said they intend to stay in the Turkish border province of Edirne, bordering Greece and Bulgaria, until Turkey opens a land route to Europe. The second one is a referral to the many deaths resulting from dangerous journeys many had taken in small, often inflatable and highly risky boats, from Turkey to Greece by sea. In the process, they paid thousands of dollars to human smugglers. Turkey's government is hosting almost 2 million migrants - mostly Syrians. Many waited patiently for months or sometimes years in Turkey for the war in Syria to stop. Now, their hopes are fading. 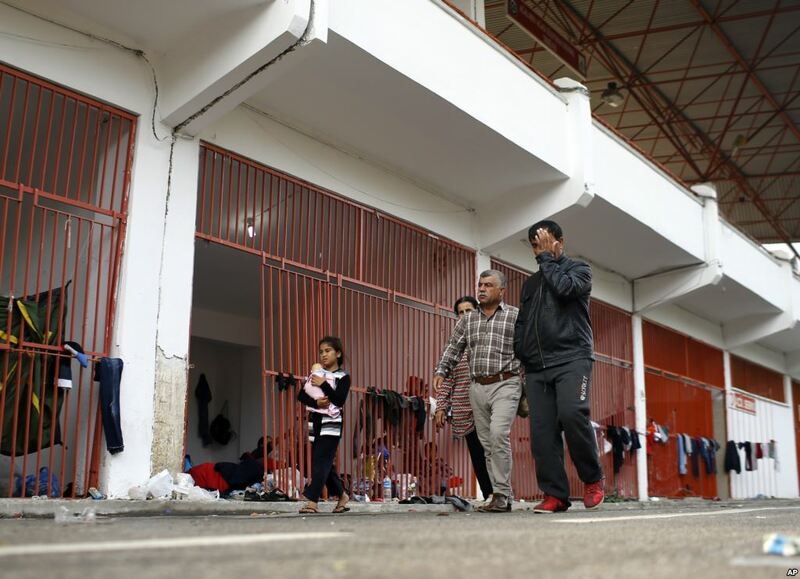 Migrants, mostly Syrians, walk in a stadium used for traditional Kirkpinar Oil Wrestling, waiting to cross to Europe near Turkey’s western border with Greece and Bulgaria, in Edirne, Turkey, Tuesday, Sept. 22, 2015. Some like Mohammad Ibrahim think the war might last for decades. Others said they had tried to make a life for themselves in Turkey, but failed. He said he will stay in Turkey if the country offers him a future, but he cannot see himself working long hours for very little pay for the rest of his life. He took 55 euros out of his pocket and held them up. This is all he was able to save after nine months of hard work - and he wants to use it for a bus ticket to Europe where he is certain a better life awaits him. Those like him waiting in Edirne in hopes of a better future in Europe include families, a 21-day old baby, and a young man in a wheelchair. Inside the stadium, freshly washed clothes hang all around. A group of children plays football in the grass usually used for oil wrestling matches. A group of young men sit huddled in a corner. One of them digs out his degrees from his backpack. He had completed a degree in software engineering from Syria and was working on another one in architecture when the war forced him to move. He had applied to Turkish universities, but could not get in. Before setting out on his journey to Europe, he worked 16 hours in a restaurant for very little salary. Others like him complain of exploitation by local businesses - and say they work long hours, but receive half the salary locals do. Most said they cannot make enough money to keep going. One woman, who introduced herself as Umm e Osama, or mother of Osama, said her husband and one son were abducted by Syrian President Bashar al-Assad’s troops. She does not know where they are. She wants a better future for her younger son. That life, she said, is in Germany. “German people are calling us,” she said smiling. Many in the Turkish border town have not heard of European countries closing their borders to new migrants, or they do not believe borders will stay closed for long. It was obvious they are not willing to leave the doorstep to Europe.